"Dr. Palmer is the BEST. She was my doctor for years!" "Five stars isn't enough to express how awesome Dr. Palmer and her staff are!" "I couldn't be more impressed!" "Fabulous doctor who cares about your health and goes extra mile." "Dr. Palmer is a very caring individual she takes time with all her patients. " "Doctor Palmer is outgoing, compassionate and professional in her practice"
If you're searching for a good doctor to take care of you and your family, look no further than Happy Healthy You Family Medicine in Glassboro, New Jersey. At Happy Healthy You, Dr. Josette Palmer and her team are on a mission to promote family medicine by encouraging patients to become actively involved in their health care both in the office and at home. Not only will you and your family receive exceptional medical treatment in a friendly yet professional environment, but Dr. Palmer and her team will give you educational tips and resources for continued health management in your everyday life. There's also an on-site lab for added convenience. After providing medical care to families of Glassboro for the past two decades, Dr. Palmer is an established physician in the community. Much of the staff has been working together for a long time as well, adding to the comfortable, warm, and positive energy you'll find at this family medical practice. 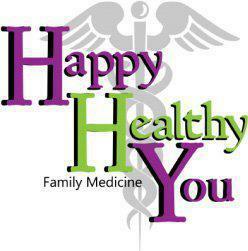 All are welcome at Happy Healthy You Family Medicine, where patients are treated like family. Call or book online to set up an appointment today! We treat our patients and staff like family. At Happy Healthy You Family Medicine, we accept most major insurance plans. Here is a list of some of the plans we accept. Please contact our office if you do not see your insurance provider listed. "Excellent Doctor. Great office staff. They are very caring and professional. I don't think you can find better care in South Jersey." "She completely takes the time and listens and just makes you feel very comfortable!! I couldn't be happier with my family doctor!! Best practice around!" "I'm very happy we met Dr Palmer. Her staff is always helpful when trying to accommodate our emergencies or schedules." "Everyone is so very nice and helpful in the office and Dr. Palmer well she is one of a kind! She really gets to know her patients." "She is a doctor who takes time and listens and treats everyone fairly and professionally. She is great, and so are all the wonderful people at Happy Healthy You." "Dr Palmer is the best! Her and her staff actually care about their patients! I wouldn't go anywhere else for health care!"